Even a brief summary of the troubled production is enough to highlight how much chaos and tragedy took place throughout the endeavor. It began with the dreadful reception of Batman V Superman: Dawn Of Justice, a film whose merciless critical drubbing and widely scorned bombast (despite ranking among DC’s highest-grossing superhero films) seemed to genuinely take its studio by surprise. The lion’s share of the blame was laid at the feet of director Zack Snyder, whose more-is-more visual aesthetic and dour, unpleasant tone seemed to actively sap any pleasure to be gleaned from the movie. As a result, the backseat driving on his follow-up, Justice League, began in earnest. What previously looked like an open system in which Snyder was allowed to steer the ship creatively for the entire DCEU soon changed. Snyder was reportedly almost fired, but was already so deep in pre-production on Justice League that it was determined keeping him on would be better both cost-wise and in terms of avoiding the bad PR that would result from letting him go. 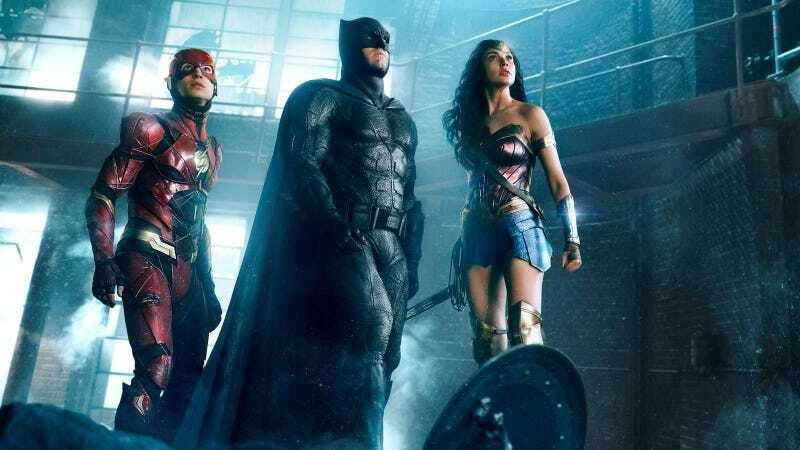 Publicly, Warner Bros. began hedging its bets, even walking back its stated two-picture Justice League deal with Snyder to instead say it would wait and see how the first one went. The production wasn’t smooth. DC and Snyder (along with his producing partner and spouse Deborah Snyder) started publicly talking about how different Justice League would be from Batman V Superman, essentially a subtle rebuke to their own prior film—not something you tend to do as a filmmaker unless you’ve been ordered to. Other creative forces, including Ben Affleck, were brought on board as executive producers to help reshape the film into a more appealing narrative. A bevy of journalists were brought onset mere weeks into shooting for Snyder to basically offer a mea culpa and swear he’d do better. This time, the message was, things would be fun. Tragedy struck in early 2017, when Snyder’s 20-year-old daughter, Autumn, committed suicide. The director and studio issued a statement announcing he was leaving the project to focus on time with his family. Avengers director Joss Whedon was brought in, initially to write a few extra scenes following a rough cut of the film, but was subsequently asked to “complete Snyder’s post-production work and film some extra footage,” as was said at the time. Some “extra footage” turned into a massive reworking of the entire film, with Whedon eventually sharing screenwriting credit for the movie, although Snyder retains the sole directing credit. Recently, new reports have suggested Snyder really was fired, months before he publicly stepped away, which would imply Whedon’s role in the whole production is even larger than previously suspected. Of course, if you just buy the Blu-ray of Justice League, you would have no idea any of this happened. It’s not surprising Warner Bros. would have zero interest in publicly acknowledging such a troubled production history, let alone delving into the messy closed-doors process that may have led to Snyder’s ouster. Even without the fact that any discussion of the creative shake-up could easily look like lurid cruelty given the death of Snyder’s daughter, there’s a very loud online contingent of Snyder defenders already pissed the studio refused to give them the director’s version of the film. Something as simple as an interview featurette with Whedon, discussing his role on the movie, would likely do little more than fan the flames of frustration expressed by some of the DCEU’s biggest supporters, which is to say, the target market for the Blu-ray. So instead, the studio has chosen to sweep the entire production of the film under the rug, leading to a collection of bonus content for the home-video release that is little more than hollow blandishments trying to ignore the fact that anything untoward might have taken place. To watch these featurettes is to enter a sanitized alternate reality in which Zack Snyder made a movie, and everything is fine. The big tease on the cover is a bonus scene, which turns out to be barely 20 seconds of Superman meeting Batman’s butler, Alfred. Instead, we mostly get perfunctory nonsense. There are “scene studies”—essentially promotional shorts giving a closer look at several set pieces from the film. There’s a brief spot showcasing the villain, Steppenwolf, played by Ciarán Hinds. We get a quick look at the costumes; several minutes spent cooing over the fancy technology employed by the characters; a brief history/introduction of the characters; and so on. Each one is usually punctuated by a quick shot of Snyder on set, and a talking head referencing the director’s vision for whatever aspect of the film the current featurette highlights. To watch these is to get the impression of someone tap-dancing to distract you from a car wreck—there’s a vague air of fakery to the whole thing, though it’s impossible to say how much of that impression comes from forehand knowledge of what went down. Normal bonus features usually go out of their way to reference difficulties faced by production, unusual challenges or other such elements that might be of interest to the viewer. The Justice League bonus features ring false because they’re so bluntly the opposite: all smiles and efficiency, the “It’s A Small World After All” of behind-the-scenes content. No one expected Warner Bros. to air its dirty laundry in public with some tell-all documentary about what really went down on Justice League. That would be weird (though let’s be honest, it would probably generate a lot more revenue in sales from curious rubberneckers eager for the salacious details). But it’s even weirder to see just how far a studio will bend over backwards to pretend everything went smoothly and there’s nothing to report. In this case, it’s not just a matter of sweeping it under the rug; the bonus features create a false narrative in which Zack Snyder delivered this finished film into your home, which isn’t fair to anyone, most of all Snyder himself, who would probably rather not be blamed for the milquetoast final product. Rather than even acknowledge the messy realities of making a giant mega-budget superhero movie—and surely there are ways it could have been done with empathy, that would be respectful of Snyder’s personal tragedy—this home-video release will stand as a bizarre curio, a collection of making-of features that awkwardly ignore, or outright deny, the true making of Justice League.